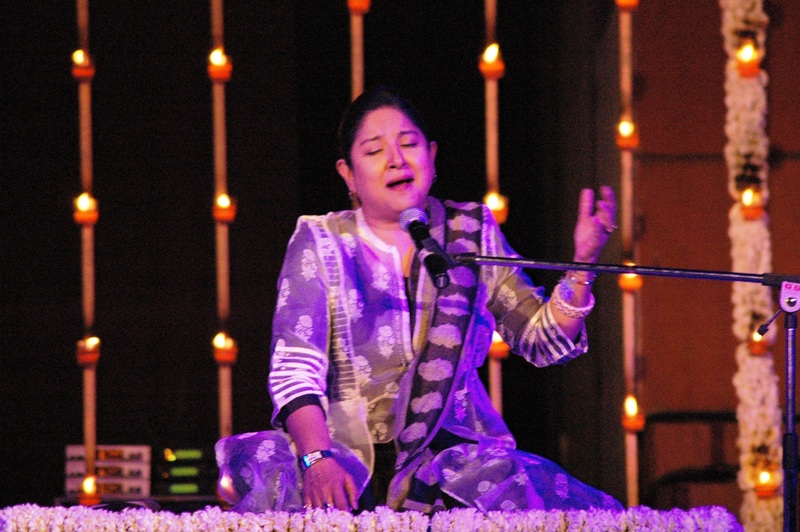 Jaipur, 20 March: The third day of the ongoing performing arts festival ‘Navras’ witnessed an enchanting musical evening as renowned singer, Zila Khan presented her Sufiana Kalam. She presented Kalams of Amir Khusrow, Ghalib and Bulleh Shah. Some of the songs she performed were Man Kunto Maulah, Dilam, Tori Soorat Ke Balihari. Accompanying the singer were, Ghulam Ali (Sarangi); Atonu Gautam (Guitar acoustic and electric); Rajan Tisge (Keyboard); Ramkrishna Karambelkar (Tabla and dholak); Shailendra Sinchury (Base Guitarist); Tarun Mishra (Drums); Ishwar Shetty (Sound engineer). Zila Khan is a creative powerhouse. Though she maintains that her primary role is that of a singer, she is also an actor, a goodwill ambassador and creative director for musical festivals. Zila is one of the finest Sufi singers in the region and can sing in various styles, whether it’s Indian classical, world music, traditional ghazal or sufi music. Tomorrow there will be ‘Meet the Artist’ with Zila Khan at 12 noon at Krishnayan (Free Entry). This will be followed by theatre performance ‘Kaumudi’ by Abhishek Majumdar staged at Rangayan at 4 pm and 7 pm. The entry of this event is through tickets which can be obtained from the JKK Office.